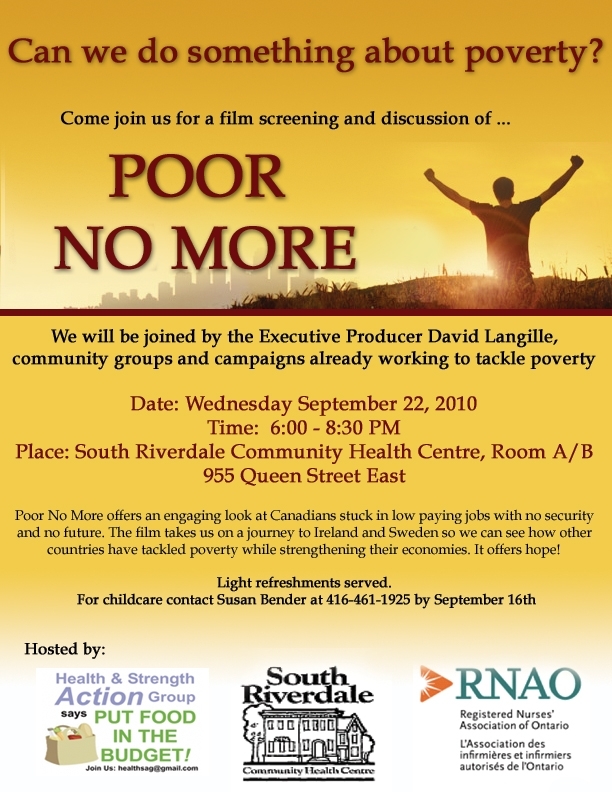 We are having a viewing of this movie on Sept 22 at South Riverdale Community Health Centre. David, the producer, is introducing his movie. There will be light refreshments served and childcare (RSVP). Following the viewing there will be discussion. In anticipation of next Thursday’s provincial budget, the media is reporting that the Special Diet Allowance (SDA) program is at risk of being cut. RNAO strongly urges the McGuinty government to end these rumours as cutting the program would be catastrophic. Act today – tell Premier McGuinty to improve the Special Diet Allowance, don’t cut it. Access to nutritious food is essential for good health, especially for those facing the everyday challenge of living with chronic health problems with limited resources. The Special Diet Allowance is a vital part of the basic benefit structure for people receiving Ontario Disability Support Program (ODSP) or Ontario Works (OW) benefits. This program provides crucial financial support to people who have additional food costs as the result of a health condition. In order to qualify, people on ODSP or OW must have the need for a therapeutic diet prescribed by a midwife, nurse practitioner, nutritionist, or physician within the parameters of the Special Diet Schedule. In November 2005 hundreds of people were left struggling to afford the diets they relied on to manage their health challenges when the government changed the SDA rules to significantly decrease access to the program as a cost saving measure. Hundreds of complaints have been filed based on discrimination due to the arbitrary nature of the Schedule. On February 17, 2010 the Ontario Human Rights Tribunal found that the SDA program violated the Human Rights Code in the way it provides benefits to three individuals. The Ministry of Community and Social Service’s troubling response was an internal memo that suggests it is considering scrapping the program entirely. Ending the Special Diet Allowance in Thursday’s provincial budget would be a terrible mistake. Instead of seeking cost savings at the expense of the most vulnerable people in our society, RNAO calls for an evidence-based, preventative public health approach that would strengthen this program rather eliminate it. Please Act Now! With the final touches being put right now on Thursday’s budget, TODAY is the day to tell politicians what you think. Please don’t delay. 1. Email the letter below to Premier Dalton McGuinty. Copies will also automatically be sent to Madeleine Meilleur, Minister of Community and Social Services, Dwight Duncan, Minister of Finance, and Laurel Broten, Minister of Children and Youth, who is leading Ontario’s Poverty Reduction Strategy. 2. Please share this action alert with your colleagues, friends and family and ask them to write as well. This information was forwarded to my by Susan from the South Riverdale Community Health Centre. Thanks Susan! !